At least eight people have died in what Russian investigators say was a bomb attack that hit a minibus in Vladikavkaz, in the North Caucasus. Investigators say the bomb was planted outside a busy market and went off as the minibus arrived at a bus stop. Earlier, officials said 11 people were killed in the explosion. Vladikavkaz is the capital of North Ossetia which has, like neighbouring Ingushetia and Chechnya, suffered sporadic violence from militant groups. The explosion happened at about 1415 local time (1115 GMT) as passengers were getting off the packed minibus, Russian officials say. The blast was caused by an improvised explosive device, fragments of which have now been found, local investigators say. They say the attack was well prepared and believe that the bomb may have been detonated by a female suicide attacker. More than 20 people, including a child, are being treated in hospital. 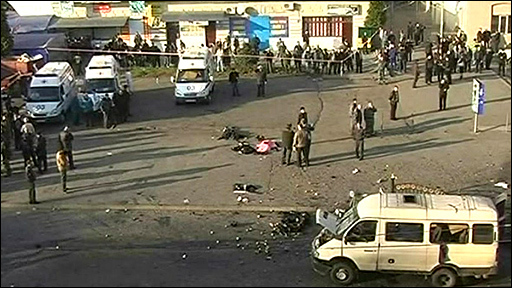 Russian television showed rows of ambulances and fire engines, and a police cordon round the area. So far nobody has claimed responsibility for the explosion. North Ossetia was the scene of the Beslan school siege in 2004, when pro-Chechen militants seized schoolchildren and teachers. It ended with more than 300 people dead after a bungled assault by Russian troops. Neighbouring Ingushetia suffers almost daily shoot-outs and explosions. The Georgian breakaway region of South Ossetia - scene of a brief war between Russia and Georgia in August - also borders on North Ossetia. Thousands of Russian troops remain in South Ossetia.